New Delhi, April 17: India is celebrating Mahavir Jayanti today with fervour and remembering the spiritual and philosophical contributions of great saint Mahavir - who with his teaching has spread the message of love, ahimsa, truth, honesty, chastity and non-attachment. 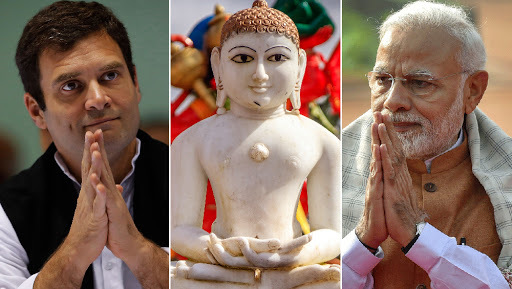 On this auspicious occasion, Prime Minister Narendra Modi, Congress president Rahul Gandhi and others wished the people. Expressing his best wishes to the people, Prime Minister Narendra Modi took to Twitter and wrote, "Greetings on the auspicious occasion of Mahavir Jayanti. Bhagwan Mahavir is a shining beacon of a tradition whose exemplary teachings have furthered the spirit of peace, harmony, brotherhood and non-violence. May his blessings enhance happiness and well-being among our citizens." Mahavir Jayanti 2019: Who Was Mahaveer or Vardhamāna? 9 Interesting Facts the Last Tirthankara of Jains. Similarly, Congress president Rahul Gandhi too wished people on this auspicious day and took to Twitter. He wrote, "Best wishes for Mahavir Jayanti. Jain religion's 24th Saint Bhagawan Mahivir's philosophy guides us to truth, non-violence and good will." Along with these prominent leaders, others like BJP president Amit Shah, Union Minister Rajnath Singh, Union Minister Smriti Irani, Congress leader Jyotiraditya Scindia, West Bengal Chief Minister Mamata Banerjee, Delhi Chief Minister Arvind Kejriwal and others wished people on this auspicious day. Born on in the 6th C BC, Mahavir was a follower of love, ahimsa, truth, honesty, chastity and non-attachment. To commemorate the birth of the great saint, Mahavir Jayanti is held every year on the 13th day of the bright half of the moon in Chaitra month. Much of what we know about the 24th Tirthankara is from Jain Text.